The Air-O-Cell® is designed for the rapid collection of a wide range of airborne aerosols including mold spores, pollen, insect parts, skin cells, fibers and inorganic particulate. The Air-O-Cell® is a unique air sampling cassette specifically designed for the rapid collection of a wide range of airborne aerosols including mold spores, pollen, insect parts, skin cell fragments, fibers (e.g. asbestos, fiberglass, cellulose, clothing fibers, etc.) and inorganic particulate e.g. ceramic, fly ash, copy toner, etc.). 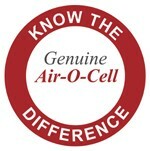 The Air-O-Cell® collects both viable and non-viable sample specimens, providing a much broader overview of potential allergens contaminants than conventional sampling techniques. The Air-O-Cell® operates upon the principle of inertial impaction. Particulate laden air is accelerated as it is drawn through the cassettes tapered inlet slit and directed towards a small slide containing the collection media, where the particles become impacted, and the air flow continues out the exit orifice. The adhesive nature of the collection media prevents the collected particulate from blurring or being washed off during the laboratory staining process, and eliminates sample loss from vibration during handling and shipment. All bioaerosol samplers are not created equal and will not provide the same results. The data they provide is a reflection on your reputation and Zefonencourages you to know the difference between them.